I HAVE sent photos of some of my flax bushes and cordylines which both have ugly marks on them. 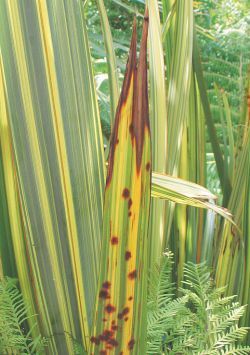 The cordylines have yellow splotches and the flaxes have brown splotches. Is this caused by a bug or a fungal disease? IT LOOKS like you have two separate problems. 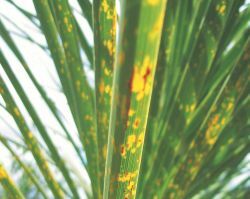 Some flax varieties, including variegated ones like yours, can be susceptible to fungal leaf spot if the conditions they're growing in are rather damp and humid. Flaxes grow best in relatively open, sunny spots with lots of fresh air blowing around them. So, to reduce the risk of leaf spot, prune away nearby growth to expose the leaves to as much light as possible and allow whatever breeze there is to blow around the plant and dry out the foliage. It's also a good idea to cut out badly spotted leaves close to the base, along with any dead leaves, to reduce the risk of infection. You could spray with a general fungicide, like Bravo, but if you improve the environmental conditions sufficiently spraying shouldn't be necessary. Your cabbage tree looks like it's been attacked by passionvine hoppers. The dark brown marks are where the initial puncture wound has become infected, while the surrounding lighter brown area is where the insect saliva has digested chlorophyll from the leaves. Although they can be a major pest of passion fruit vines, passionvine hoppers attack a wide range of other plants. They inject saliva into the leaves as they feed and have been known to spread diseases from one plant to another. 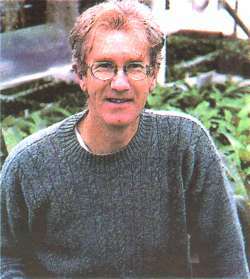 They are suspected of being implicated in the spread of cabbage tree decline disease which has led to the demise of many old established native cabbage trees throughout the country. Adult passionvine hoppers are about 1cm long and look like small moths but with mottled translucent wings. You often see several together resting on a twig, and if disturbed they'll quickly fly off. The young are wingless, have a fluffy tail, and when disturbed hop high into the air. Control often isn't necessary as they seldom do enough damage to trees and shrubs to warrant any action. But the effect on cabbage trees can be unsightly, so you may want to try spraying. This can be tricky though, as adults fly away and nymphs hop off as soon as you try to spray them. It's best to take action early in summer as soon as you see adults or nymphs, as by autumn the worst of the damage has been done. You can use contact insecticides such as Nature's Way Insect Spray or Garlic & Pyrethrum, but you need to make sure to actually get the spray on to the hoppers. Late evening or early morning is a good time to spray as they seem less active then. You could also use a systemic product like Confidor or Rogor 100 which is absorbed into the sap and affects hoppers when they feed.